The Field Lane Ragged Schools, which Dickens visited in 1843, supplied him with the terrifying images of Ignorance and Want in A Christmas Carol so well realized by his illustrator, John Leech. A subdivision of Safron Hill, between Charles Street and Holborn, Field Lane was then one of London's most disreputable slums. 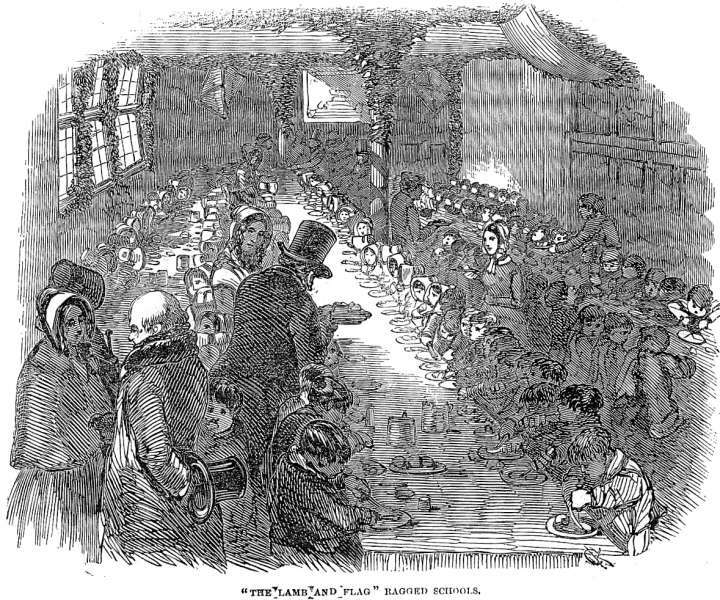 Clerkenwell was another such impoverished area in the metropolis; just as Dickens and banking heiress Angela Burdett Coutts collaborated on providing a day school for the children of Field Lane, so a charitable committee sought, like the two charity collectors in A Christmas Carol, sought to alleviate the hunger of the poor and provide them with seasonal cheer. The Committee of this excellent Institution having decided again to appeal to the subscribers for funds to enable them to furnish the children with a good Old English entertainment, accordingly set on foot a subscription, at he same time announcing that the balance would be appropriated towards the establishment of an Infant School. The result of this appeal to the good-feeling of the public at this season of hospitality has exceeded the most sanguine expectations of its promoters; for it is stated, that, after paying all the expenses, the balance will be sufficiently large to induce the Committee at once to establish an Infant Day-school. Among the subscribers to this fund are Lords Ellesmere, Ashley, and Harrowby; Mr. Justice Erle; George Hitchcock, Esq. ; Messrs. Nicholson, of St. John-street, distillers; H. B. Ker, Esq., &c.
Tuesday, the 2nd [of January, 1849], was appointed for the Christmas festival, and all was bustle and animation in the miserable courts alleys surrounding the Schools. The three School-rooms were tastefully decorated for the occasion; and conspicuously were displayed some handsome maps, objects in natural history, &c., presented to the Schools by the Committee of Council on Education; while its motto. "Ecce Agnus illa Dei" [Behold the Lamb of God], suggested to the contemplative mind feelings of the most grateful character to the Giver of all Good for the origin of an institution so well calculated, under his blessing, to train up the children of the poor in the way they should go. The following was the bill of fare: — 190 lb. of fine roast beef, 12 plum puddings of 16 and 18 lb. weight each, 2 cwt. of the best potatoes, 9 gallons of table ale, bread, &c. The puddings were composed of 77 lbs. of plums, 25 lb. of currants, 7 lbs. of candid [sic] peel, 1 gallon of milk, 1 1/2 lb. of spice, 10 quaterns of flour, 8 lb. of bread, 240 eggs, and 24 lb. of suet. At twelve o'clock the children began to assemble; by one no less than 296 were seated; and a most gratifying spectacle it was to behold these poor children all decently clad — here and there some poor tattered and shoeless child proclaimed the nature of the institution in which they were assembled; but all were clean, forming a most powerful contrast to the state they were in before the schools were established. The children being seated, and prayer having been offered to the Giver of all Good, they chaunted grace before meat with admirable precision; and in a few minutes all were engaged in despatching the good things before them; the ladies of the committee, teachers, and friends rendering all the assistance in their power to the enjoyment of their poor fellow-creatures. Dinner being ended, and the children having chaunted grace after meat, they were briefly addressed by Mr. Watts, the superintendent, who pointed out the great advantage of attending school, and of cultivating a religious education. The proceedings terminated by the children singing "God Save the Queen;" each child being presented, on leaving the School, with a penny, as "a Christmas-box." In the evening the children were again assembled to witness the exhibition of a magic lantern [show] on moral and religious subjects, accompanied with suitable remarks by Mr. Stephen Shirley, of Drury-lane [Theatre], who, unsolicited, placed his services at the disposal of the committee. And thus ended the third Annual Festival of the Lamb and Flag Ragged Schools.